Routing throughput running the latest 4.0.1-66 firmware and our router test process measured 63 Mbps WAN to LAN, 60 Mbps LAN to WAN and 61 Mbps total with up and down tests running simultaneously. This is relatively low when compared with other current-generation routers, but more than twice as fast as the 25 Mbps routing throughput of the FVS318G and plenty for many DSL and even fiber connections. This result is significantly lower than the 95 Mbps routing throughput that NETGEAR quotes on the 318N's data sheet. NETGEAR explained the difference was in the test programs used. They used Ixia's IxAutomate to achieve their benchmarked throughput. But they also confirmed our lower result when using Ixia's IxLoad. NETGEAR's also explained our 25 simultaneous sessions result as due to the 318N's default enabled Block UDP Flood firewall setting. Since our test opens as many UDP connections as it can, as fast as it can, it tripped this detector. Since I've already sent the test sample on to Doug for his review, I'll ask Doug to confirm NETGEAR's 6000 session spec. The IxChariot composite plot in Figure 4 shows up and download speeds evenly matched in the simultaneous routing test. Table 2 gathers together the routing numbers for both 318G and 318N for your comparison pleasure. The 318N is not Wi-Fi Certified but properly defaulted to 20 MHz bandwidth mode on power-up anyway. It does not support Wi-Fi Protected Setup, so I manually established a WPA2/AES secured connection before testing. All tests were run with this secured connection using our latest wireless test process. To establish a quick ranking, I used the Router Chart, filtered for 2.4 GHz band routers only, which shows a mid-range ranking for the FVS318N in Figure 5. To drill down a bit more, I ran a Wireless Performance Table with two other wireless VPN routers for comparison, a Cisco RV120W and Cisco RV110W. Of the two, the RV120W is more comparable to the FVS318N since it supports full IPsec tunnels, although it doesn't support SSL. The 318N's highest throughput of 59 Mbps was measured in Auto 20/40 MHz bandwidth mode running downlink in Location A. Running simultaneous up and downlink tests in Auto 20/40 MHz mode in Location A boosted total throughput to 78 Mbps. Note that single connection throughput isn't really improved by using Auto 20/40 mode. The 318N doesn't win many of the match-ups, with the RV120W having stronger low-signal performance. The RV120W's downside is poor uplink throughput, even with strong signals. The IxChariot plot in Figure 7 shows some rate shifting behavior during the Location C test that was present in multiple runs. You'll see high throughput variation in the other mode plots linked below, too. I also experienced disconnects during tests in Location F. This reinforces the results in Figure 6 that the FVS318N's low signal performance isn't anything to write home about. The 318N's routing throughput is better than the 318Gs, although neither match many of today's much less expensive consumer routers. 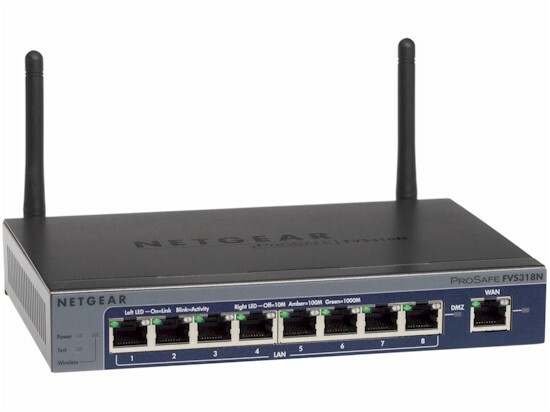 In general, I haven't been impressed by the wireless sections included in VPN routers and the 318N hasn't done anything to change my mind. It's not the worst I've seen (that would be the Draytek Vigor 2910G), but certainly not the best, either. You can find more details on the 318N's features and VPN performance info in Doug's review. You can also further explore and compare the FVS318N's performance using the Router Chart and Router Finder.